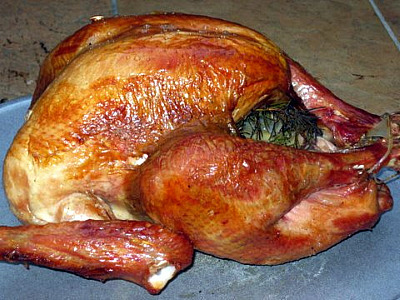 It’s hard to believe that Thanksgiving is just a few days away! I am in the midst of planning for this year’s meal and though it would be helpful to create a post with some of my favorite recipes. I hope this provides ideas and inspiration for your holiday feast. 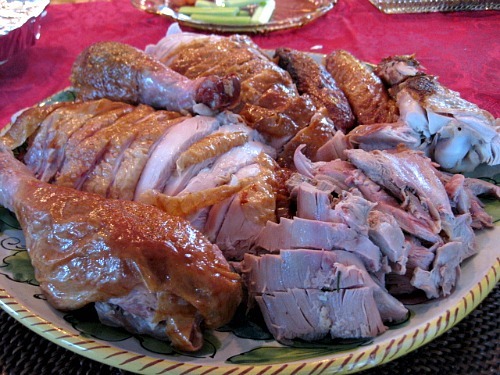 Good Eats Roast Turkey on the Big Green Egg – Brandon and my dad cooked the turkey on the Big Green Egg last year and it turned out wonderfully. Alton Brown’s method for preparing a turkey is perfect and roasting it on the Big Green Egg instead of in the oven added so much flavor. Classic White Dressing – This dressing recipe has a short ingredient list but tastes great! 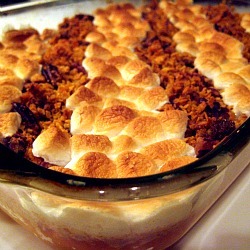 Sweet Potato Casserole – With alternating rows of crunch and marshmallow topping, this sweet potato recipe is sure to please everyone at your table. I’ve been making this one for several years now. It’s delicious and you just can’t beat the presentation. 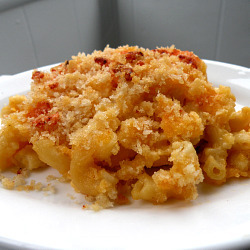 Macaroni and Cheese – I first tried this recipe as part of my 68 Days of Gourmet project. It totally won me over and I’ve been singing its praises ever since. Try it, you won’t regret it! Creamed Leeks – While searching for nontraditional sides for last year’s meal, I came across this highly rated recipe for creamed leeks. This dish ended up being a surprise hit with the whole family – even those who had never tried leeks before. Brussels Sprouts with Caramelized Onions and Shallots – This was another of the dishes that came out of my effort to mix up our sides. 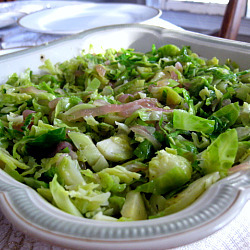 This recipe even had self-proclaimed brussels sprouts haters professing their love. 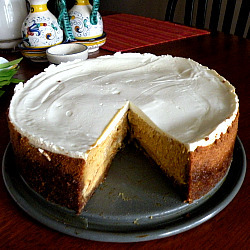 Bourbon Pumpkin Cheesecake – Pumpkin cheesecake is a fun addition to a dessert spread full of pies. 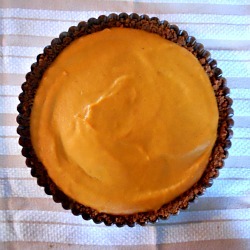 Pumpkin Tart with Gingersnap Crust – This tart is unbelievably easy to prepare and delicious. 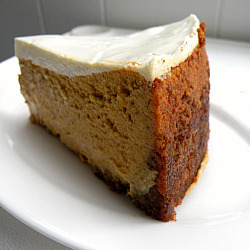 The gingersnap crust is what really sets this off, especially when topped with a dollop of whipped cream. I was so excited to prepare our Thanksgiving feast with my dad this year. It’s rare that we have the chance to be together in the kitchen and we’ve never cooked the Thanksgiving meal together. This was the first year that Thanksgiving was at my parent’s house instead of my grandmother’s house and while Brandon was in law school we stayed in Birmingham for Thanksgiving due to finals. My mom pitched in with two killer desserts – Sweet Potato Pecan Pie and Apple Cranberry Pie. We emailed back and forth about the menu for several weeks. We had the main dishes set but wanted to mix things up with the side dishes. I spotted these Creamed Leeks on the Epicurious Thanksgiving Guide and thought they sounded like the perfect accompaniment to our meal. I’m embarrassed to admit that I had never worked with leeks before and I was oh so thankful that my dad had taken to the time to watch a video of the test kitchen director cleaning and preparing the leeks for this recipe. I wasn’t sure how these would go over with the dinner crowd but I was happy to find that they were extremely well-received. I did get several comments on what a different side dish it was (which was what I was going for!) but everyone enjoyed them – some even went back for seconds. 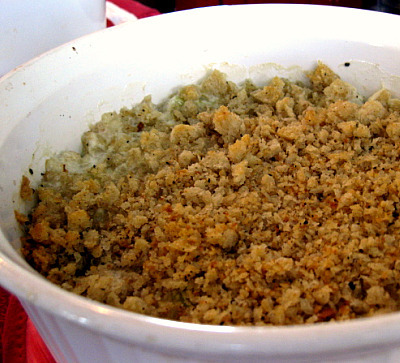 These Creamed Leeks would be a fabulous side dish to any holiday meal! Preheat oven to 450 degrees (we had other things going on in the oven and couldn’t have the temperature that high so we cooked them a little longer at a lower temperature). Cut each leek into an 8-inch length, measuring from root end, and halve lengthwise. Then cut crosswise into roughly 1 1/2-inch pieces, you should have about 8 cups). Wash leek pieces in a large bowl of cold water, agitating them, then lift out and transfer to another bowl. Repeat with clean water, then drain leeks well. Watch this video if you have never worked with leeks before. Melt 3 tablespoons of butter in a medium sized heavy skillet over medium heat. Stir in bread crumbs, 1/4 teaspoon salt and 3/4 teaspoon pepper and cook, stirring frequently, until crisp and pale golden. This should take around 3-5 minutes. Remove from heat. Melt the remaining 3 tablespoons of butter in a large heavy skillet over medium-low heat. Add leeks and remaining 1/2 teaspoon of salt and 1/4 teaspoon pepper. Cover the skillet but leave the lid slightly ajar to allow steam to escape. Cook for about 12 minutes, until tender, stirring occasionally. Using a slotted spoon, transfer leeks to a gratin dish. 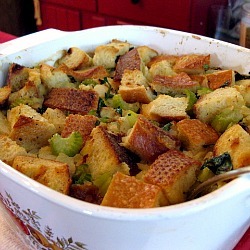 Slowly pour cream over leeks and scatter bread crumbs on top. 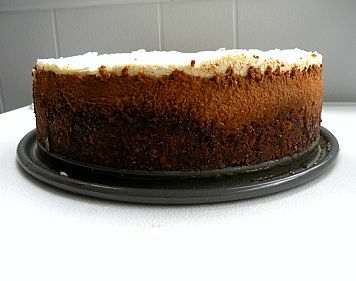 Bake for about 15 minutes, until cream is bubbling and thickened and crumbs are golden brown. – Bread crumbs can be cooked 1 day ahead, cooled completely uncovered and kept in an airtight container at room temperature. 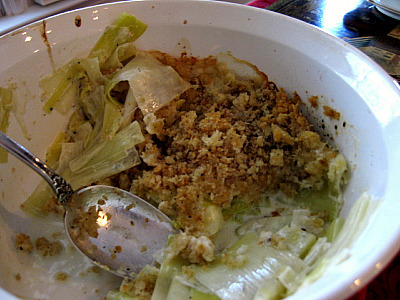 Scatter bread crumbs over leeks just before baking. 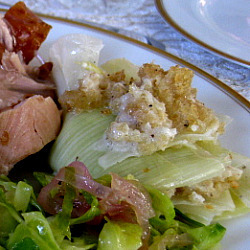 – Leeks can be cooked and assembled in dish with cream (but not sprinkled with crumbs) 1 day ahead. Cool completely, uncovered, then chilled, covered.